Adventure Creation Kit (ACK) is a game development tool by Chris Hopkins that allows you design and play top-down 2D tile-based RPGs like Ultima IV & V of yore. Despite being an MS-DOS program, it runs on modern Windows and Apple computers via the ACK Launcher program. Also, despite being more than 15 years old, it is easy-to-use, very flexible and fun. 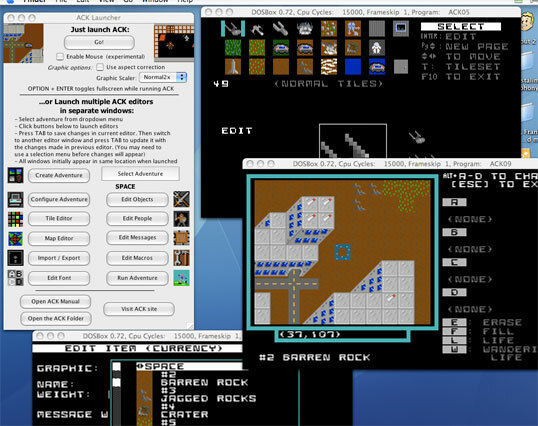 Chris’ inspiration for making ACK was the 80′s classic Adventure Construction Set by Stuart Smith, which also allowed you to create your own RPGs. Hopkins improved on ACS in almost every way. Chris Hopkins finished ACK in 1995 and made it freeware sometime in 2000, and I hope these pages will spark some interest in the fine program he made.